Will a child that has a processing disorder ever improve to the point that he can be on grade level without a constant struggle? My 10 year old grandson struggles- we have to work with him many hours at home for him to be able to keep up in the class room. My own son has SPD and our initial research into homeschooling was because we felt it would be difficult for him to cope in the classroom, and I could envisage hours of homework hell in the afternoon trying to help him catch up on work he had missed. Research and experience seem to indicate that people with SPD don't really grow out of it, but they do learn to cope with it when it is diagnosed, understood and supported properly. As children with SPD grow up, they need to learn to identify the things that stress them and the things that soothe them. This can only be done if they understand their symptoms and the way their body reacts. I would recommend getting hold of the book The Out of Sync Child by Carol Kranowitz, and/or looking into the Alert Program www.alertprogram.com for more information to help your grandson. If you are already spending hours helping him in the afternoon, perhaps consider homeschooling as an option for him - better use of his time and yours. It will give him space to learn properly and develop the skills he needs to cope, to be better prepared as an adult. In your grandson's case, homeschooling would be a "greenhouse" where he can be nurtured and grow strong before being transplanted back into the world as a stronger person. He is being battered by the storms of having to cope with SPD in an unsympathetic school environment, and may really benefit from the time to grow straight and tall in a greenhouse. I also recommend "Raising the Sensory Smart Child" by Lindsey Biel and Nancy Peske to all my "sensory" parents. It's a fabulous book! Lindsey is an occupational therapist who lives and works in New York. Years ago, she worked with Nancy Peske's son, who she diagnosed with sensory processing dysfunction as a young child. Years later, they wrote a book together to spread the word! The book is very parent-friendly. Check it out! I read that you homeschool your son and I plan to homeschool my daughter next year. I am swimming in a sea of curriculum. Which ones are best for her to learn? I can't seem to find the right one! She is sensory defensive, has hardly any balance, and her perception is off. Any suggestions? Mattie Rose is now 7 years old and is at the top of her class. She is now playing softball for a youth program. When she was 3 years old she had problems with her speech. We could not understand a word she was saying. We had this wonderful therapist named Maline who came by our house and took time to help my little girl. Now she can read and write without any special help. Me and her mom had her on a strict diet and did not deviate from it..no sugar and we replaced the whole milk with soy mike..soy is great.when she has her melt downs they're easily corrected..i love that lil girl she is my world! 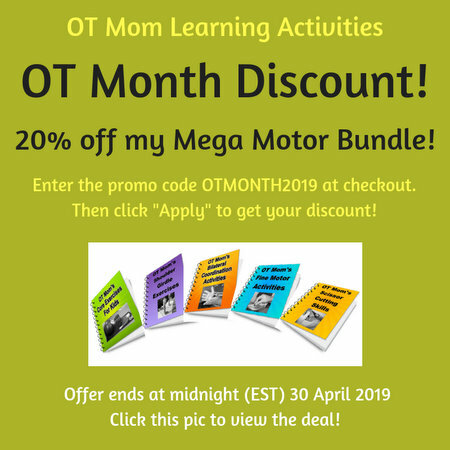 Hi there, can you contact me through my Contact OT Mom page (see the bars on the left) so I can get your email address and email a response to you? It will be kind of off-topic to respond in this thread! Thanks! My son has SPD, seems mild, but he is like a roller coaster. Now he is in phase where he refuses to go to sleep and, when he finally does, then wakes in middle of night and refuses again. He is often grumpy, angry, appears uncomfortable for no apparent reason. He seems slow to learn, unable yet to share, tantrums when he doesn't get his way. He has had OT and speech weekly in school and at home, but is about to age out of early intervention services. I guess I'm looking for some info that points to how to address his diet and whether we should, and other info regarding prognoses for kids like mine? I just want him to be happy. reply to my almost 3y.o. I am sorry your son is struggling with sleep so much at the moment. But yes, diet can play a role, and there are lots of sensory strategies that we can try in order to help our kids settle down and sleep well. Different ones work with different kids - have you asked yout therapist for ideas? They may have some good insights from their time with your son. These strategies will also help him in day to day relationships and moods. I am sorry that I cannot advise you specifically, as each child who has SPD issues is very different, and there is no one-size fits all solution. All the best as you help your child, and be assured that there is light at the end of the tunnel! Return to Sensory Processing .